Oh no! All the toys in Santa’s workshop have come to life and scattered across the grid! Can you find them and help save Christmas? 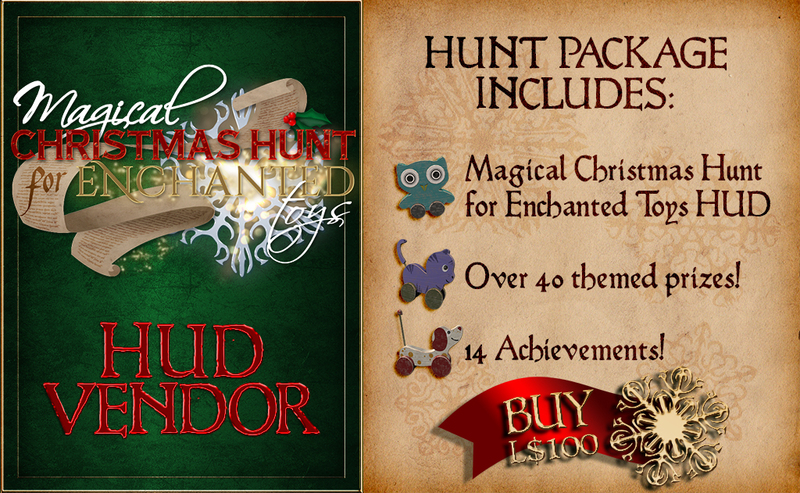 Join our Magical Christmas Hunt for Enchanted Toys and win amazing prizes and achievements! The magic runs from December 14th until December 28th 2017. You will need a HUD to play. Teleport to Mad City and purchase the HUD for 100L. When you first wear your HUD you will be randomly assigned to a team. Finding Toys will help your team earn points that unlock prizes. IMPORTANT: You may change your team to a different color if you wish. Please not that you can do it only once and before you have found any Toys, so if you wish to be on a different team, you must make that decision instantly. Look at the Toy List on our website or click on the ? button on your HUD to see the locations where the Toys are hidden. You can also use the website to see the Top 3 Hunters of the day and your ranking on the Christmas Hunt leaderboard. Please make sure to allow the locations to rez around you before you start searching. That’s to help you see things better so you can avoid from walking into walls or bumping into other hunters. Use your radar to find the Toys. The closer to the center the Toy pointer is, the closer you are to a Toy. Arrows on the compass below the radar will indicated whether a Toy is above or below you. There are also sounds that will guide you. We have different kinds of Toys around the grid that all react to the HUD you’re wearing. ROBOTS are active toys and give you the most points – 50 points each. They last 72 hours once they are first rezzed. STUFFED TOYS are cute, fluffy toys that move around and that give you 25 points and last 48 hours after they are first rezzed. WHEELIES are the most common Toys. They wheel around and are worth 10 points each and their lifespan is 24 hours. But wait! That’s not all! We also have a very special CHIMNEY in play too! When you find it, instead of getting points, you will win an INSTANT PRIZE! Teleport to the Mad City Toy Factory by using the home button on your HUD. Check your HUD for your Current Points available. Find the prize you want and make sure that your team has unlocked it for purchase. This information can easily be found at the top of the vendor board. If your team’s color shows an unlocked symbol then just click the board to get your prize! If it shows a locked symbol then get back out there and hunt for more Toys! 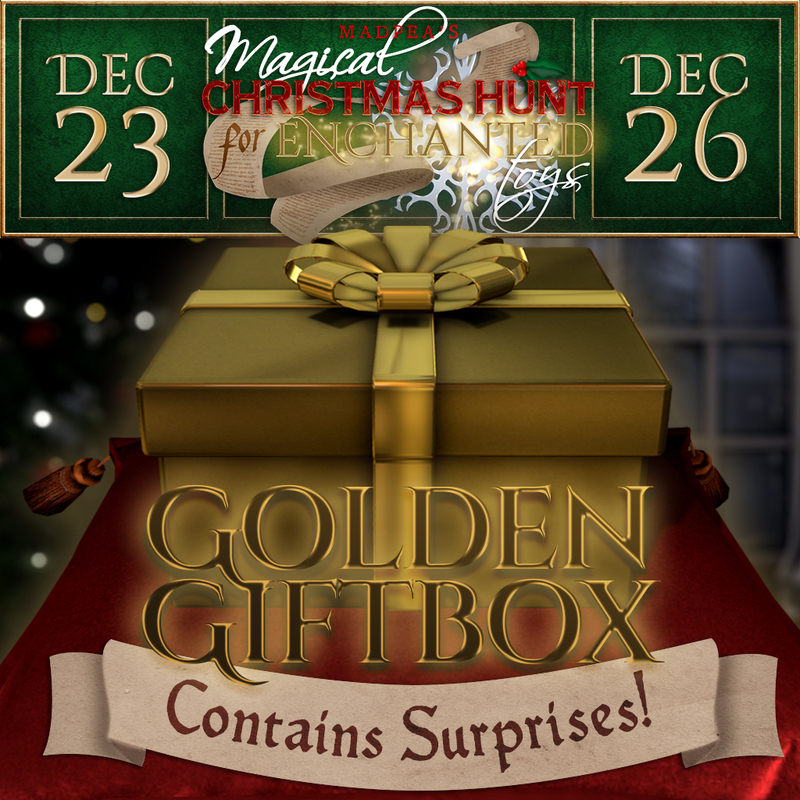 Mysterious Golden Gift boxes are being activated on the 23rd of December! When you find one, you will win an instant prize or an X amount of Points you can use for claiming prizes. Keep an eye out for them. They’re only available until the end of day 26th of December. What are the collective points? 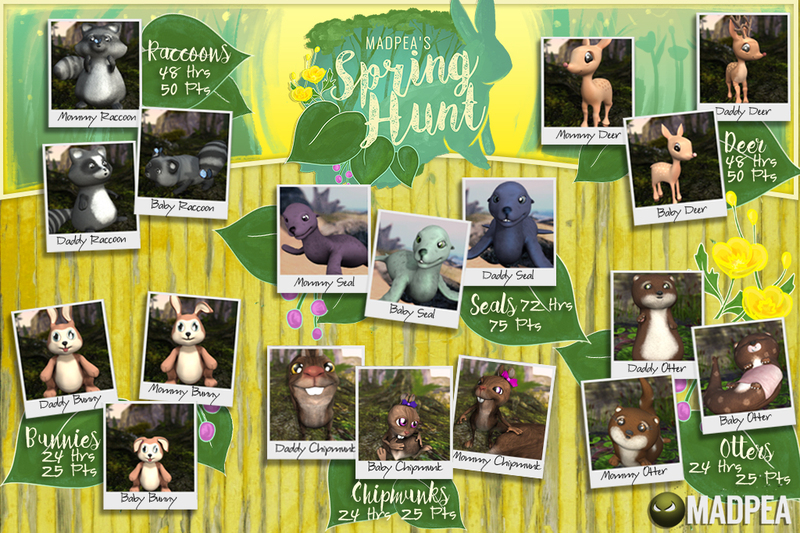 The MadPea Christmas Hunt is broken up into three teams: White, Red and Green. Each team works together to raise their collective points total. Why do I have three different point counters on my HUD? What does it mean? Team Points are points for the whole team’s effort. All the points that every hunter on your team has collected are added together to make this number. Net Points shows the points that you have currently available to spend on prizes. It’s the Total Points you have earned minus points you have spent. Please note, there is no reason to keep saving your points. They can be only used for The MadPea Christmas Hunt prizes and using them to grab prizes doesn’t lower your position on the leaderboard. Gross Points match your points on our Christmas Hunt Leaderboard. They are all the points that you have earned during this hunt. How can I win the rewards? Can I see the prizes beforehand? The first 5 prizes are available always at the Mad City Toy Factory and they are also listed on this page as well as our Facebook page. As soon as one of the teams unlocks a prize, its poster will be revealed. Don’t forget, if you find the Chimney, you’ll win an instant prize! Can I buy Toys for my land? Absolutely! 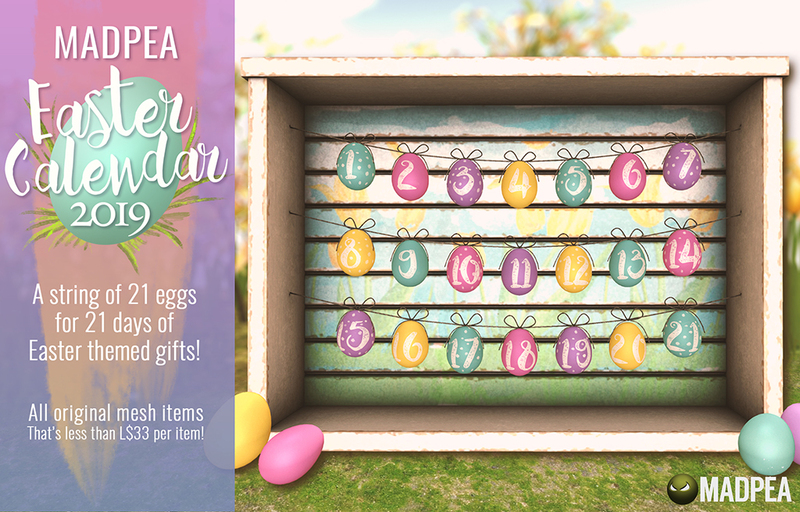 You can find them at our Mainstore or Marketplace. You can also click on your own Toys to receive points! Is there a chance I could buy these Toys without the scripts? HELP! I don’t have access / don’t want to go to a location that’s rated adult. How can I avoid them? Each time you click on the HUD button to get a new location you will see the location rating and can choose which ones you want to visit. HELP! I found a Toy, but it’s not working. What do I do? 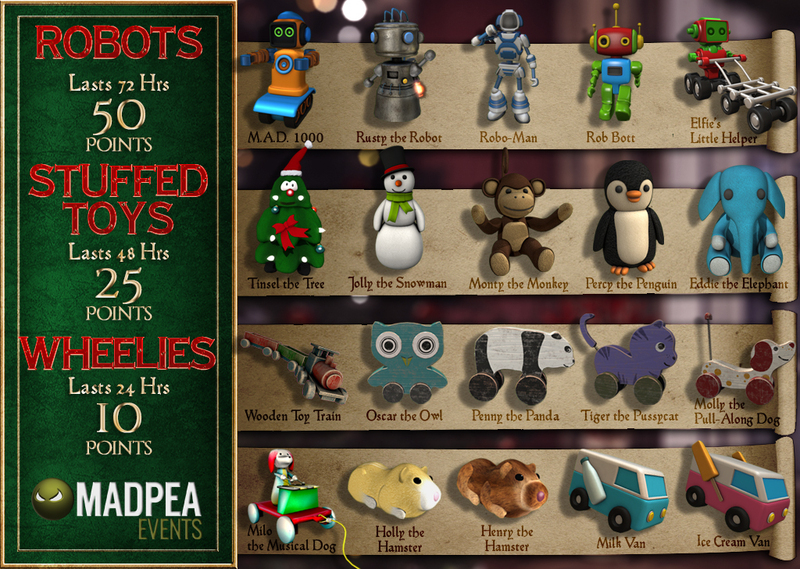 Make sure the Toy belongs to the MadPea Christmas Hunt (check the Toy chart above). Have you muted the Toy owner? If so, the Toy won’t react to you. Are you close enough to the Toy? You have to be within 5m distance from the Toy to click on it. Are scripts allowed on the parcel you’re on? If not, please contact our Customer Support and we’ll message the owner. Is something in front of the Toy? It’s possible that an invisible prim is covering the part you’re clicking on. Check that with ctrl+alt+T or right click to touch the Toy. How can I get achievements from this hunt? All you have to do is to keep hunting! The more Toys you find and the more locations you visit, the more achievements you will receive. There are 14 achievements in total in this hunt. Don’t forget, if you level up during this hunt, you’ll earn a new LEVEL PRIZE too! You can also earn an achievement by getting your friend to play. Click on our Refer A Friend poster at the Game Start and follow the instructions. To check which achievements you have, visit our Player Portal. HELP! I can’t enter a location, what do I do? 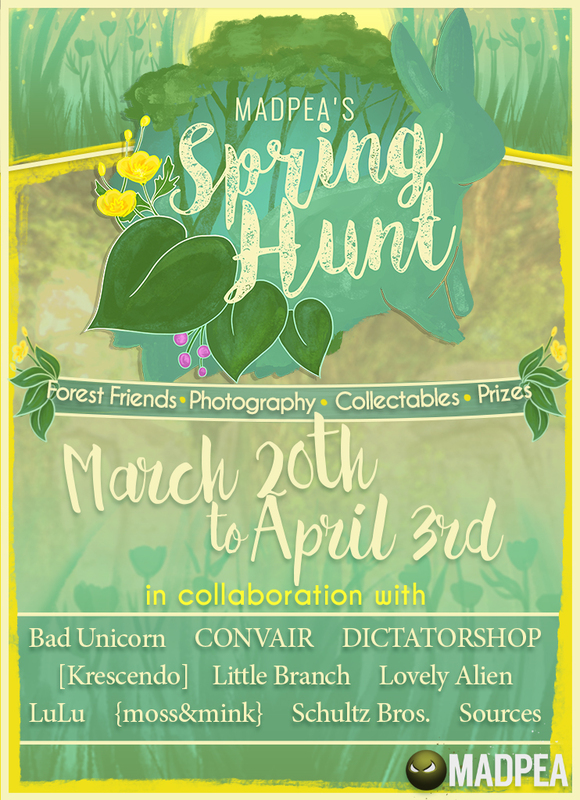 MadPea is not responsible for the locations. Anyone can buy a Toy and rez it on their land. If you can’t enter a region, you should contact the owner to solve the issue yourself, MadPea unfortunately can’t help you there. We suggest you click on the ? button to go to a different location. Do I need the Magic Candy Cane or Sleigh for hunting? What do they do? They are just fun add ons for you to have. 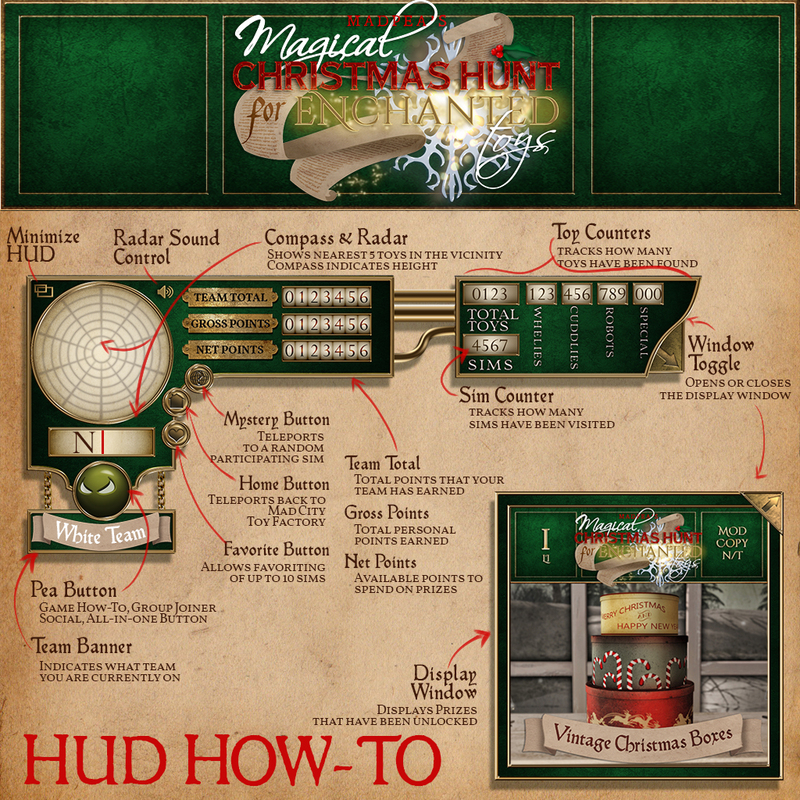 All that you need for Toy hunting is the HUD. The Sleigh is a wearable vehicle and will show the number of the Toys you collect and the Candy Cane has awesome visuals that are activated when finding and clicking on a Toy. I teleported to a region that is supposed to have Toys, but my radar isn’t showing them. What do I do? First check if there are scripts allowed on the parcel you’re on. If not, please contact our Customer Support and we’ll message the owner. The Toy might have recently died too. Use the ? button for a new location. It could be that the Toy has just expired! Click on your radar, it will refresh. Make sure that the Toy is not above or below you. Arrows at the bottom of the the radar on the compass will point up when it is above you and down when it is below you. HELP! I have a question that’s not answered here! 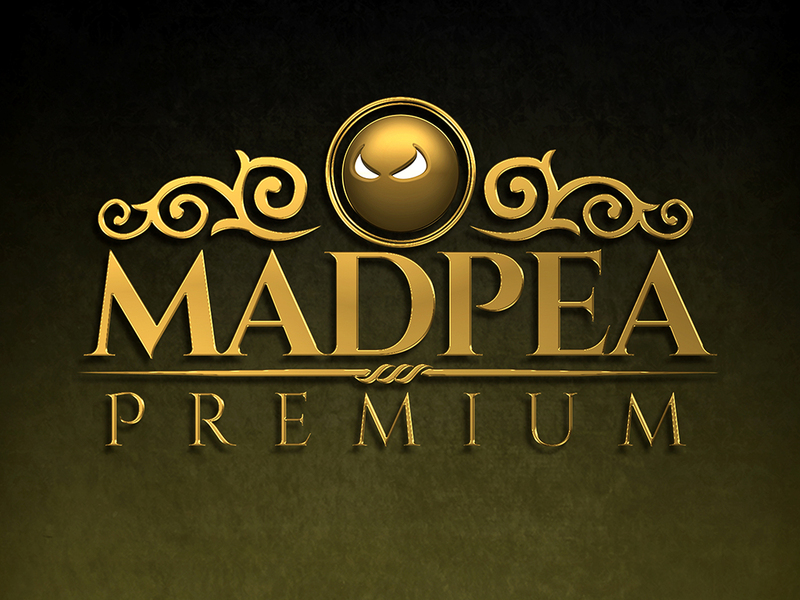 First, try our MadPeas group chat in-world, you might get your answer fastest there, or you can contact our Support. 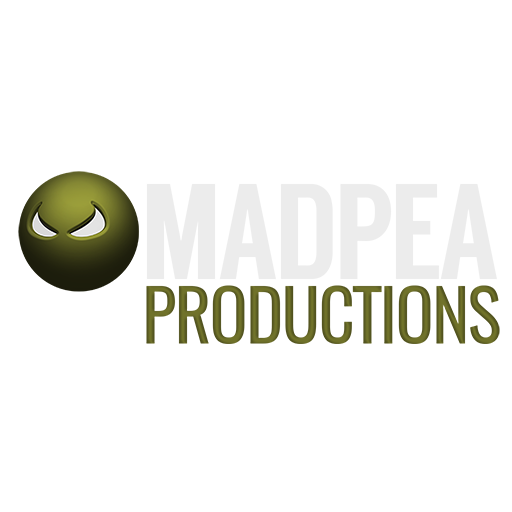 The environments you are visiting do not belong to MadPea Productions. They belong to the respective land owners. Thus, do not grief their customers, visitors, members or residents. Do not break their posted rules. When you are playing, we would really appreciate it if you wore the MadPea Group Tag. Unless otherwise instructed to do so, do not rez or lay any objects from your inventory at any of the locations you will visit in the game. We are aware that Second Life has its own issues that we can not control, such as location logouts, reboots, or lagging and crashing. Should anything happen beyond our control that disrupts or halts the hunt, we will announce it via group notice at the first possible opportunity, providing further instructions relevant to the issue. Do not harass other hunters, do not instigate conflicts, and if you get stuck, do not whine and complain in group chat. Doing any of these actions will result in your revocation of your chat rights. You are allowed to communicate in group chat and help each other out. You are however NOT allowed to give out direct slurls to the Toys. The prizes will be locked until a team collective goal of Toy points has been reached. You can see this number on your HUD. 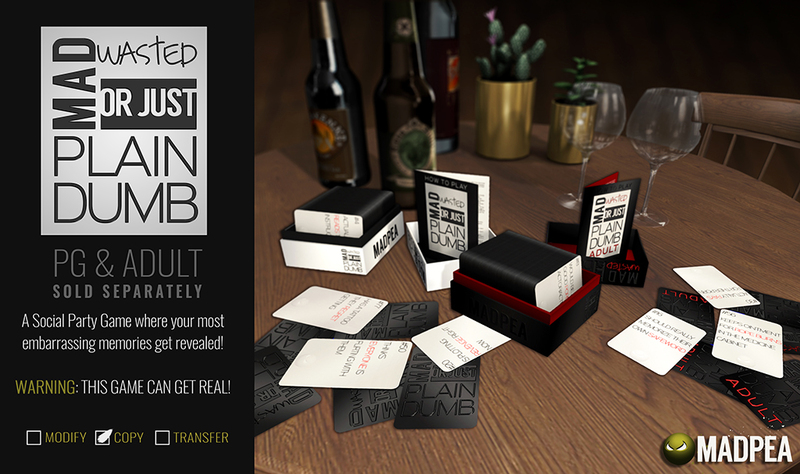 As soon as your team reaches a new level, a prize is unlocked and you can redeem it. If another team unlocks a prize level first, don’t worry! Your team can still collect Toys and earn points to also unlock that prize. The prize pictures appear here daily as teams unlock them. They are also added on our Facebook page.